Have you started your holiday shopping yet? I'm taking a new approach to gift giving this year...one for me and one for you! Kidding, but I must admit every time I go to the mall to purchase an item on my list I get so distracted in stores that I am not meant to be in. Does this happen to you too? It's impossible for me to make a trip to the mall without stopping in Anthropologie. From the sparkly accessories to the super chic dresses, skirts, and cozy cardigans, I can't seem to control myself!! Now you know why most of my family members receive Anthro gifts. Shhh. Don't tell them. Since December is jam-packed with holiday parties and work events, I figured I would dedicate a post specifically for little back holiday dresses (LBHDs). How gorgeous is this shape shifter dress from Pink Slate? I'm mostly in love with the gorgeous pleat details on the back and silver zippers along the shoulders. 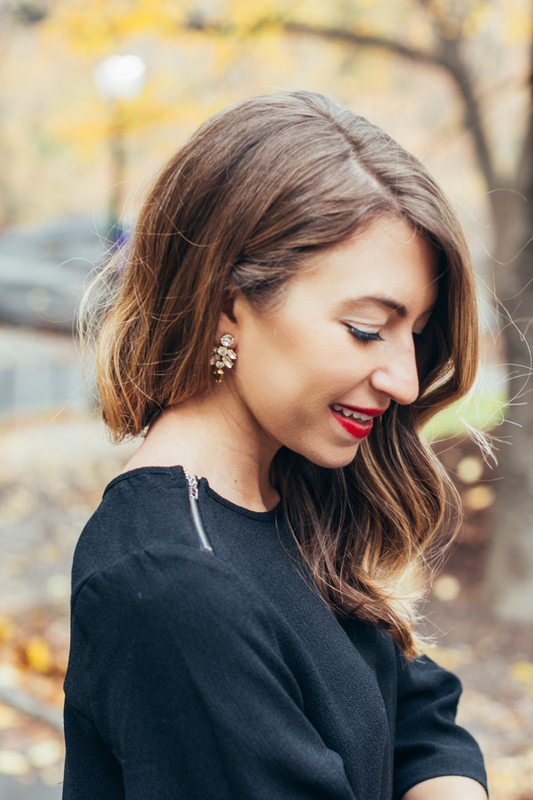 Talk about a LBD update just in time for the holidays! I paired this dress with red accessories, drop earrings, and a bold lip to create an old hollywood look. It just feels so festive to me! Keep in mind that shift dresses are appropriate for all body types. If you need a gift for a lady friend in your life... this dress wouldn't disappoint them! To see more glam LBHDs scroll through the below widget and click directly to shop. love the pleated back on that dress - so cute! and perfect for the holidays. Love this on you, the back is amazing! Aww these photos are so pretty and festive. You look adorable! Cute dress. Love the shoes, so happy I stumbled upon your blog- I LOVE it!! Stunning outfit babe, love that dress and the pop of color!! !